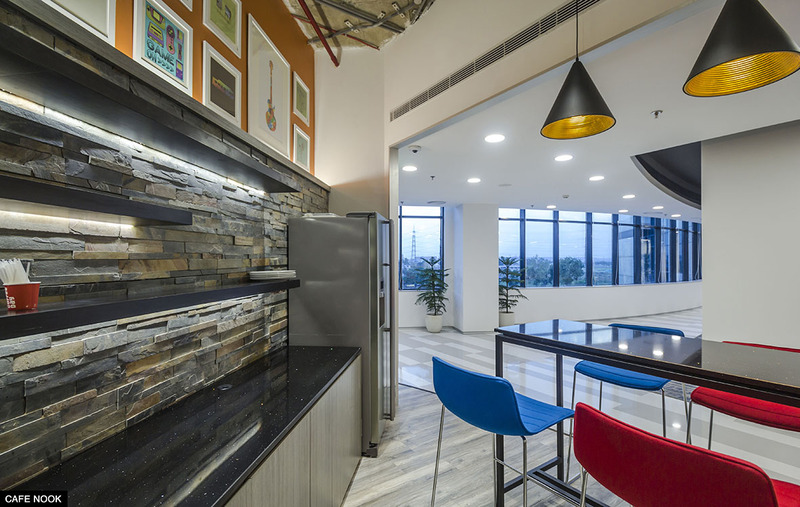 The new office of SOTI Inc at Gurgaon serves as its headquarters for the Asia Region. 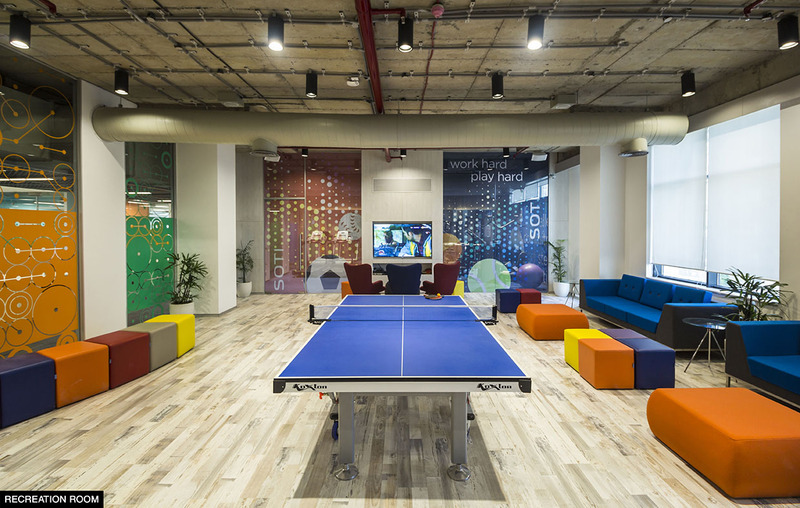 The 51,000 Sqft office space with capacity to seat 450 plus employees has been designed to create a workplace which not only inculcates creativity but also promotes a fun and learning environment. The Design Strategy attempts an alternative approach to Workplace Interiors. The office has been planned to maximize natural light and views surrounding the building. The spaces with high usage have been placed around zones where maximum natural daylight is available. The existing floor plate was awkwardly split into two separate zones. The challenge was overcome by creating a central reception and introducing a free-flowing corridor around it. The corridor not only connects the two disjointed spaces but also enhances the reception as an island. A casual lounge and a small Café were also further carved out along the corridor to create an exciting visual experience around the island. 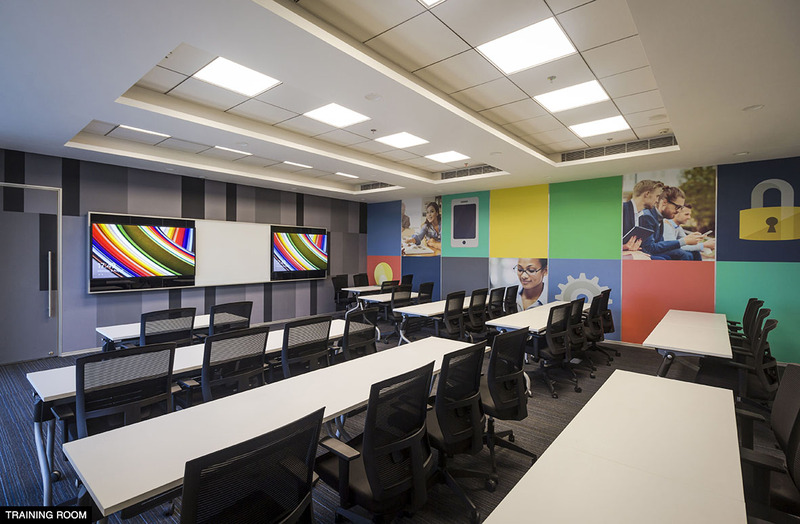 The board room and training room are also placed on this corridor and connected with the reception. The lounge has been visually integrated with the reception to create a larger-than-life reception. The corridors then seamlessly flow into the main open office through a well-defined circulation plan. 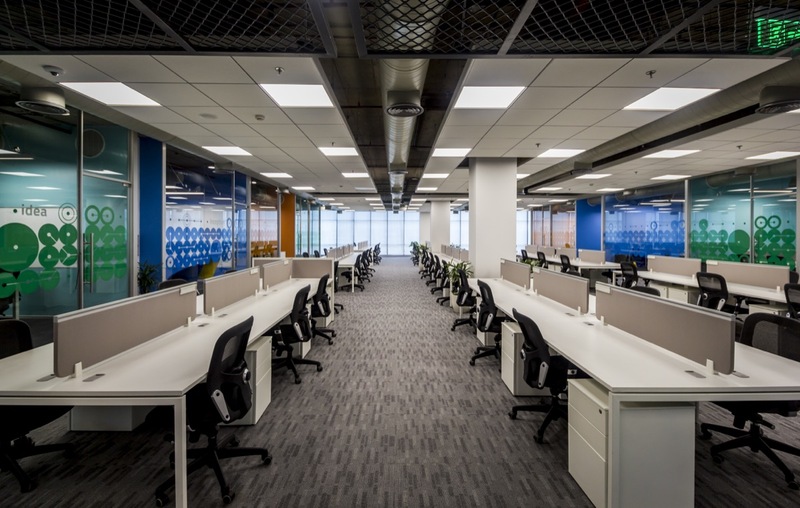 The main work hall has been divided into separate zones by placing enclosed intermediate bays of Office Cabins, Meeting Rooms and Collaborative spaces. 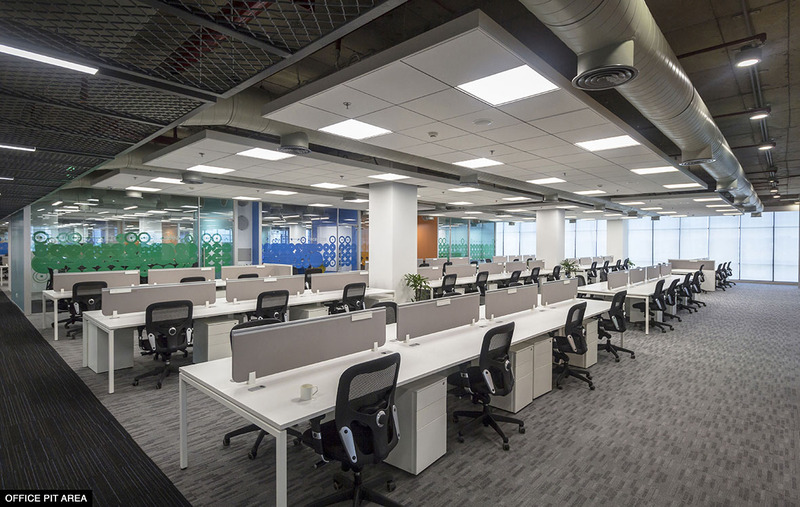 This not only allows natural light to penetrate deep into the office but also ensures that these facilities are near the general workstations. The bays also fragment the large hall into smaller scalable working spaces allowing effective interaction and collaboration amongst teams. Each of the spaces offer a lot of variety in terms of their design and material usage. The reception has been contrasted between a dynamic stone pattern, vibrant colours and rustic finishes to enhance the island affect. 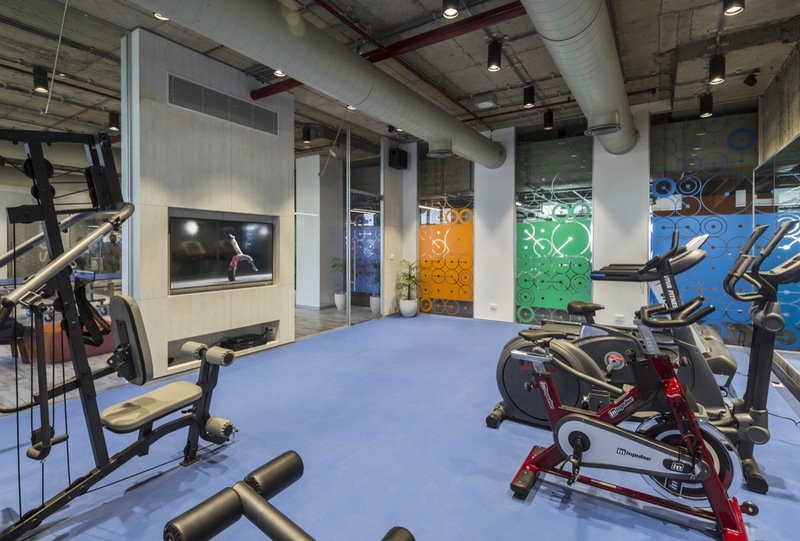 The customised metal ceiling with full height curved glass wall further enhances the space. The workstation pits with exposed RCC roofs are interspersed with floating acoustic ceiling panels. Expansive full height glass partition system has been evolved specifically for the project. 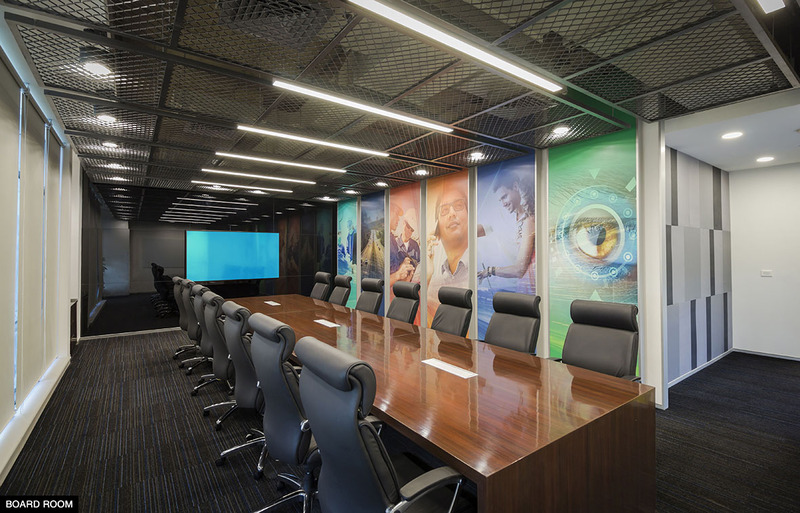 Customised metal ceilings line the corridors to highlight the circulations spaces. 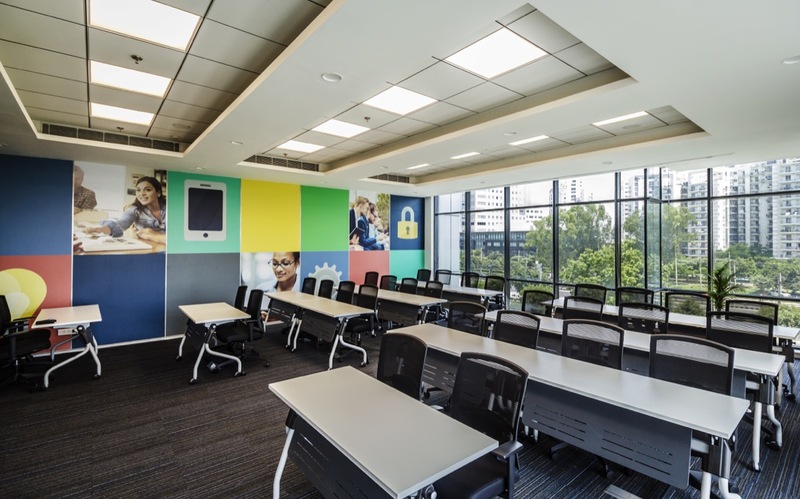 The cabins, meeting rooms and collaborative spaces also have fully exposed RCC roofs emphasised with exposed air-conditioning ducts and electrical conduits. 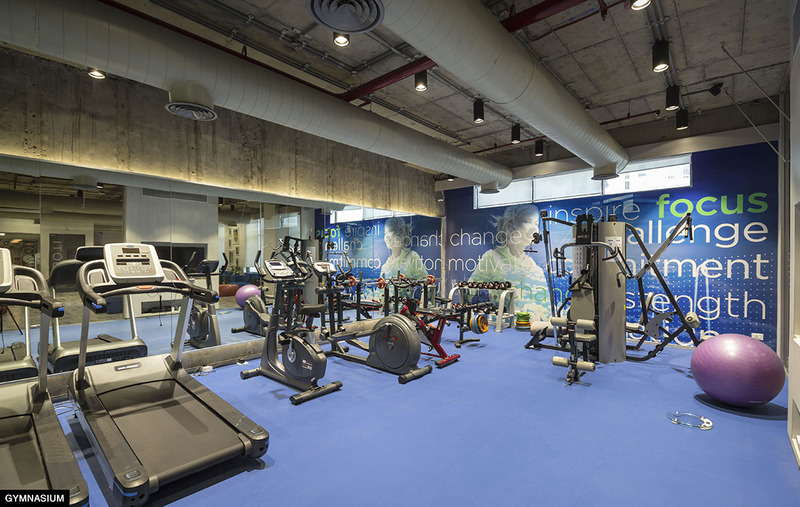 The Cafeteria, Gymnasium and Recreational spaces are informal in their character. 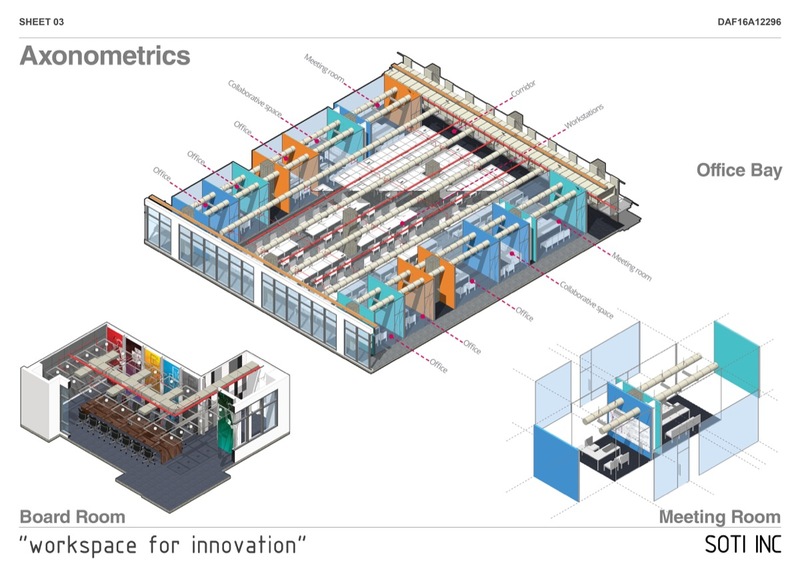 “Workspace for Innovation” has been the driving force behind the overall design evolution. Collaboration is a great way of generating ideas. 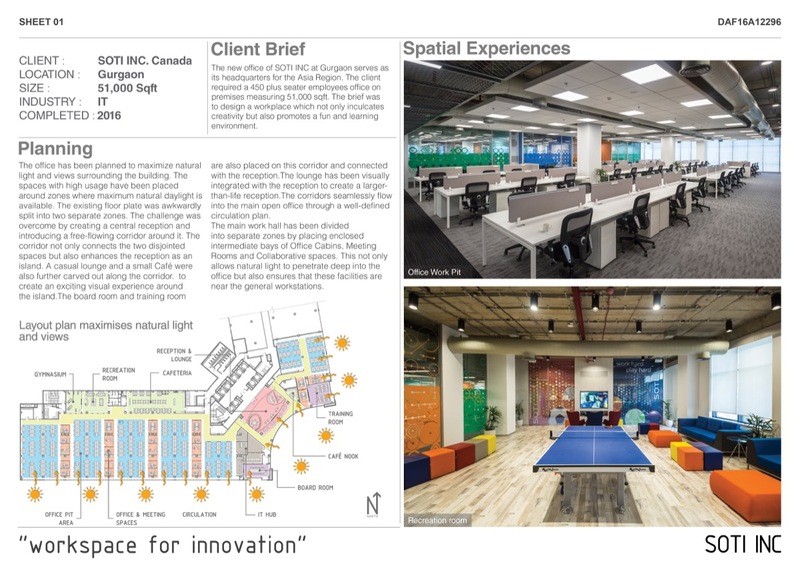 This has been reinforced by ensuring a good mix of collaborative spaces and break out areas throughout the office space. 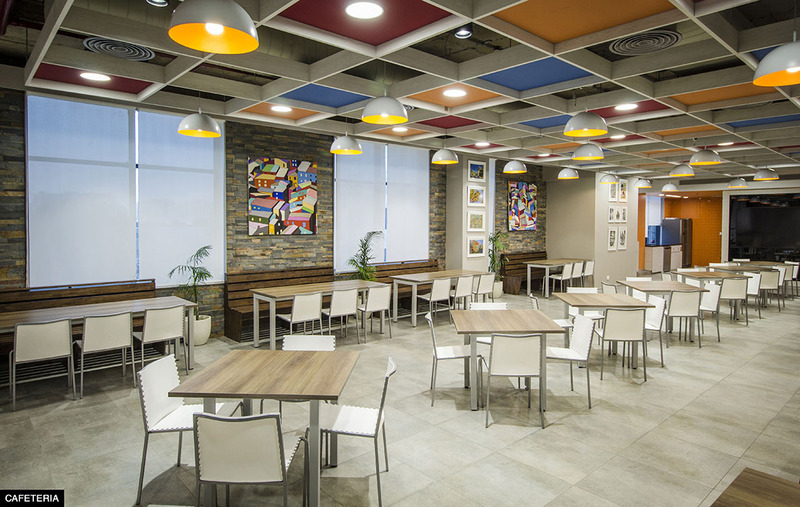 Maximum natural light has been provided in the office to boost creativity and energy levels. 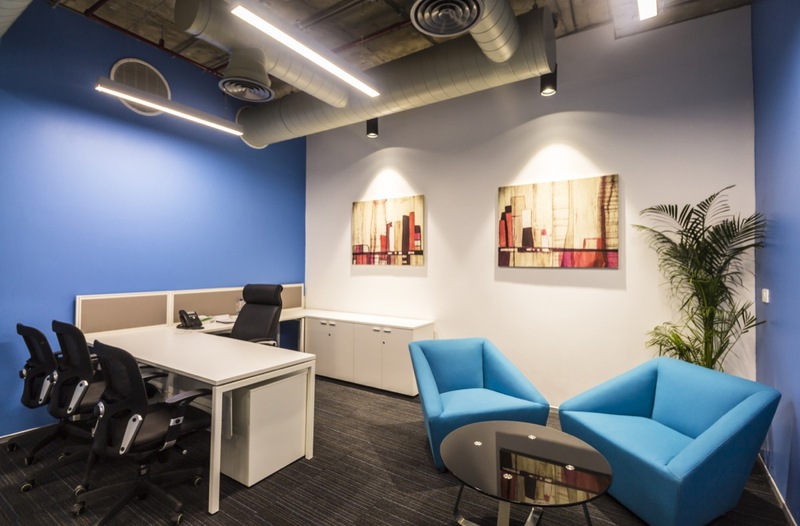 Vibrant colours have been used in the office not only to strategically contrast with the overall grey scheme but also stimulate creativity and productivity. The aesthetics of the overall office allows exposure and openness to new experiences and stimulation. The overall interiors of the workspace offer a lot of variety and each space is tailor made for the purpose it is intended to be used. 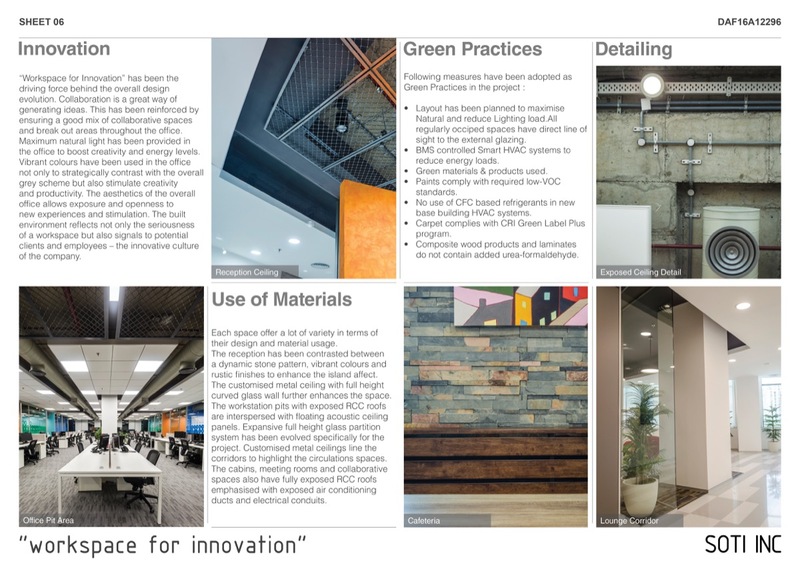 The built environment reflects not only the seriousness of a workspace but also signals to potential clients and employees – the innovative culture of the company.